Growing up, my family ate a lot of chicken. You would think I would be sick of it by now, but it is way too versatile of an ingredient to get sick of chicken! You can change the flavors so much. And as long as you don’t overcook it (which I do sometimes; hey, I’ve got two kids who often distract me just long enough!) it is always yummy. Also, when I was pregnant with my youngest, my doctor had me on a high protein, low carb semi-diet and the eating habits just sort of stuck. Don’t get me wrong; I still love my pasta and bread, but in limited quantities. I don’t remember when I first made this chicken, but I’m sure it was a really long time ago. I think I found it in a magazine or online somewhere. I don’t remember the origin of the recipe or the actual original recipe, but over time, it has evolved into my own recipe. Something I just make out of habit, you know? This is another dish my husband requests a lot. And it is super simple so I don’t mind making it at all. It comes together really quick so it’s a perfect weeknight meal. Plus, my kids love it so that alone makes it a winner in my book. *I used ½ an 11oz jar of apricot preserves. It comes out to about ½ – ¾ cup preserves. **Soy sauce is salty enough, even the low-sodium one, that you really need to make sure that the broth is low sodium also. Otherwise, your dish could end up being very salty tasting and that would not be good. Heat some oil in a large skillet over medium heat. After splitting your chicken, lightly salt and pepper both sides and add to the oil. Cook about 3 minutes on each side, just long enough to brown the chicken. Remove from the skillet. Add the preserves, broth and soy sauce to the skillet and bring to a boil. Stir to combine and melt the preserves into the sauce. Make sure to scrape up the yummy bits left from browning the chicken. Once the sauce is combined, turn the heat down and let it simmer for a few minutes. Add the chicken back to the sauce and let it finish cooking, another 4 or 5 minutes. Turn the chicken over about half way to make sure it is coated in the sauce. After the chicken is done, put it on a place and spoon some of the sauce over it. Add a quick side dish and dinner is served! Sometimes I think this recipe came out of thin air. I made a salad but I had no dressing in the house. I usually do, but this time I didn’t. Lately I’ve been making this ranch dressing, which is delicious, but I didn’t have it or the ingredients to make it. Luckily, I had what I needed for this dressing. It only has three ingredients and it is really yummy! Vinaigrettes (a mixture of vinegar and oil with seasonings) come from the French word for Vinegar (obviously), but they are a pretty universal staple in most kitchens. They are most often used as a dressing, but can be a marinade as well. Generally speaking, the ratio is 3 parts oil to 1 part vinegar, but I didn’t do that since I just sort of tossed everything into the blender until it looked good. And since I didn’t follow the vinaigrette rules, I’ll just call mine a dressing. Traditionally, vinaigrettes are pretty basic: vinegar, oil, salt and pepper. In the US, we tend to add a lot of additions, like truffles, berries, garlic, blue cheese, etc. Seems pretty typical of the US, but also pretty yummy! Put all ingredients in a blender and mix until well combined. Can we talk about Chia Pudding for a second? OK, so I’ve seen tons of recipes for Chia Pudding and I’ve heard all about how delicious it is and how it is a healthy addition to your diet. Well, who doesn’t like pudding?! I thought I’d give it a try. When I opened the chia seed package, I expected to smell nothing. That is not the case. They smell earthy, and not in a good way. They smell like seeds. Like seeds you are planting in a garden. They do not smell like something I would put in my food. Everything mixed together fine and the “pudding” was ready in only a couple hours. The texture was weird with the seeds still whole, so I decided to blend it up. I saw a picture on another blog of blended up chia pudding and it was smooth and silky. I think she just used a photo of actual chocolate pudding because when I blended mine, you could still see bits of chia seed. It was fine, though, texturally speaking. The pudding tasted NOTHING like chocolate. Or pudding. Not even a teeny, tiny, little bit. You know what it tasted like? Seeds. Like seed you are planting in a garden. I could taste a hint of the cinnamon I added, but none of the almonds. I ended up adding a bit more vanilla, some sliced bananas, and peanut butter, but it was still very bland and seedy. Bottom line: It was not good. I mean, it was edible enough in that it didn’t make my stomach turn. I ate it for breakfast 3 days in a row to give it a fair chance, so I feel like I’ve earned the right to say I do not like it. 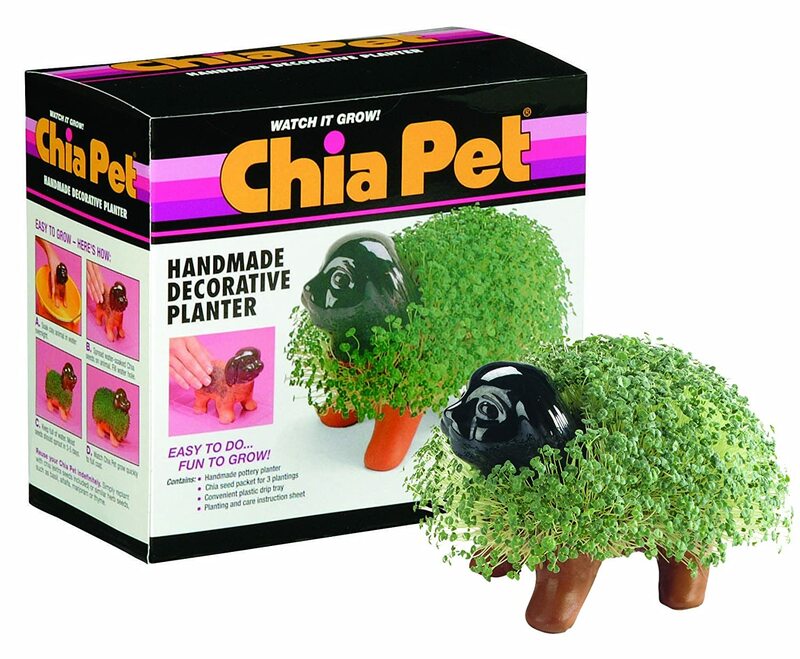 Maybe chia should just stay on weird pet-statues. I cannot deny the health benefits of chia seed pudding, but I feel like I was duped, like that time I tried Kale Chips only to discover it was like eating bitter, crunchy leaves. “You won’t miss the real thing” they say. I love Chicken Parmesan. It’s so warm and comforting to me. I mean, you have pasta swimming in a rich tomato sauce topped with crispy chicken covered in gooey cheese. What’s not to like? And it’s easy to make, so even better! Not surprising, this dish originates from Italy. While the exact origins are unknown, the northern town of Parma and the southern regions of Campania and Sicily all claim it as their own. The dish is referred to simply as parmigiana and is made with fried eggplant (aubergine). The version using a breaded and fried meat (veal, chicken) is popular in other countries, particularly those with a high Italian immigrant population. In one bowl, beat up your eggs with a fork. In a second bowl, mix together the breadcrumbs, Parmesan, oregano, basil, and garlic powder. Add your oil to your skillet over medium high heat. Prep the chicken while it gets up to a hot temperature. Dip a chicken breast in the egg, covering all sides. Let the excess drip off. Dip the chicken in the breadcrumb mix, covering all sides. Press the crumbs in so it really sticks. Repeat with the other pieces of chicken. When the oil is hot (flick a little water in the oil and it should sizzle), put the chicken in. Cook it for about 5 minutes. Flip the chicken over to the other side. Ladle some sauce over the top and top with a couple pieces of cheese on each piece of chicken and put the skillet into a 350 degree oven (make sure your skillet is oven-safe. If not, you can let the chicken sit in the skillet for a couple minutes to crisp up and then transfer to a baking dish and add your sauce and cheese at that point). Let the chicken finish cooking in the oven, probably another 7 minutes, or until the cheese is all melted and gooey. (Check the chicken before serving to make sure it’s cooked all the way. The timing depends on how thick the chicken is). Coat the noodles with sauce and put on a plate. Top the noodles with the chicken and serve, probably with a light green salad because it’s a pretty rich dish. If you’re feeling particularly carby, serve some garlic bread on the side. Because, yum.